Standard Rohit Shetty formula with 'inspirations' from a host of Bollywood and Hollywood films. The film's story is largely copied from Hum and The Best Of Me. The poster is copied as is and some story elements from The Best Of Me. Johhny Lever is wasted as he has not been allowed to do his thing fully and/or the lines written for him are weak. The one song Rang De Tu Mujhko Gerua is nice to hear and filmed very well. Hats off and kudos to the special effects team who have photoshopped Kajol and SRK to such a level that they seem to be 19 year olds in almost every scene and definitely in all songs. The story is nothing new as we all have seen Hum. Anyway, timepass. Rohit Shetty needs to now produce a Golmaal style movie and blow up more cars! Last edited by echarcha; December 20th, 2015 at 10:41 AM. So, You mean to say Sutradharji is also a napunsak. Re: Dilwale - Rohit Shetty needs to blow up more cars! The original car damage swequence was in the beginning of Qurbani where Feroze Khan smashes a mercedes (very valuable in those days of licence permit raj). It was to add shock value to the film. Shetty unabashedly copies full movies .. Makes lot of money so nobody cares. We aren't exactly making art movies here. Watch it once and forget it forever. Last edited by sarv_shaktimaan; December 24th, 2015 at 12:37 PM. Kya GPL padi hakle ko ..
Bollywood superstar Shahrukh Khan on Tuesday maintained that he had not said anything which merited an apology, but regretted that the box office collection of his film 'Dilwale' was adversely affected due to protests by those who 'misinterpreted' and 'misconstrued' his comments on intolerance in the country. "I have not said anything that I should apologise (for). I will fall in my own eyes if I do that," Shahrukh said at a media meet to promote his latest film 'Dilwale'. Agonised over protests against the film, Shahrukh said it made him sad when his work did not reach the people as that was the only way he could return the people's 'love' for him, and appealed to his fans to watch and enjoy the movie. Shahrukh said his comments on the intolerance issue was not represented properly. "At some point of time, I do regret people could not understand what I said. It was not represented properly. If anybody feels bad about it, I regret it completely. "I just want to wish that all the people who wish to see the film on their own, please go out and see it. Don't get misled by people who perhaps misconstrued what I am saying, so I regret that this has happened. I feel extremely sad," Shahrukh said. "I apologise if somebody got disturbed, please go out and enjoy the film because it's not me, there are thousands who have made it with a lot of love." "(It's) too hard for me to understand why something that we make for your happiness would somehow turn into something that becomes controversial or tainted." Angered by Shahrukh's statement on 'religious intolerance', Bajrang Dal activists opposed the film's screening in Araria and Patna districts of Bihar. Protests also took place in Ghaziabad, Varanasi, Jabalpur and many places in Rajasthan. The 50-year-old actor was clad in a black suit, and was accompanied by his "Dilwale" co-star Kajol, who was wearing a black saree. Shahrukh said the 'intolerance' controversy has hit box-office collections of the movie in some parts of the country. "I can't deny the fact that I've been reading messages on Whatsapp. I've been reading messages on social media, and even on ground that there has been activity all over the country, where the film has been stopped, and not allowed. "Yes, box office collections have been hit, I don't know exactly the places. But they have been," he said. "I have been an actor for 25 years in this country. I would like to say I received love from every corner of the country, in spite of religion, region, caste, creed, gender. "And the only way I can return the love is through my work. And I try my best to do that. I succeed some times, and sometimes I fail, but I try my best to do that. So it saddens me when any of my work can't reach the people, because I do work two or three times a year. It is saddening." There have been images of the superstar in the social media which Shahrukh found offensive. He said he has even been linked with people he doesn't have any links with. "A lot of the things I say are misconstrued perhaps, misrepresented, perhaps misinterpreted sometimes. And I am not someone who can sit here and say... this amazing amount of love from my countrymen and women... I have any issue with it in terms of tolerance and intolerance. So I don't. "But of course like the other day, I was sitting in and somebody put a tweet which does not belong to me. And I can't clarify," he added. "I see a news which say I am related to an X person who is entirely against my country but that's not true. I have no logistic way to explain all this, at my stage and age. I am a representative of my own country and I am thankful to everybody, but I can't keep explaining that." And I thought our Ghazni public had forgotten all about Hakla after Aamir Khan's remarks. Now Chhotu will think 10 times before his next movie if at all he finds a producer. 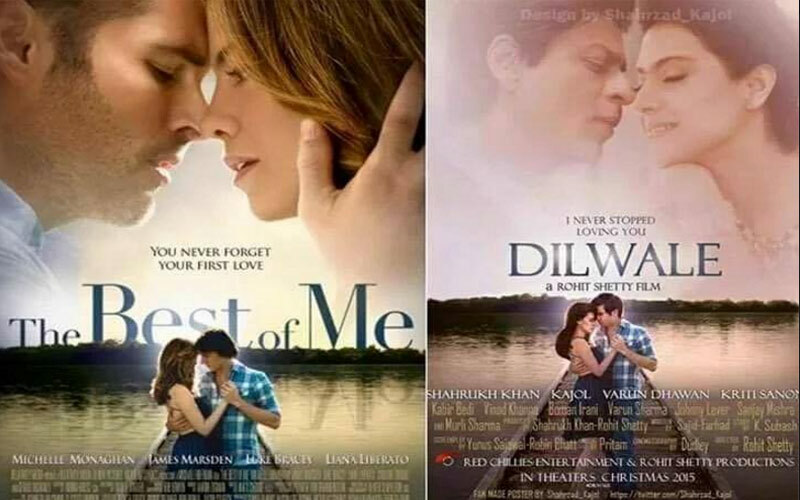 dilwale got punished due to amir's remarks ? Paparazzi asked similar questions to Salman Khan also who refused to cave in. He had some wierd tweet but promptly deleted it on his Abbajan's advice.